Pet friendly hotels in Boston total a minimum of 45 establishments. No matter what the season, the historic and vibrant city of Boston is a city of adventure for any traveler. Teeming with architectural landmarks, opera houses, art galleries, chic shopping and gourmet restaurants, there is plenty to satisfy even the most discerning tastes. Visit our Boston Travel Guide designed specifically for pet owners. Here you will find discover everything you will need for your trip. If you’ve never ventured to Boston before, watch this informative video and get a taste of one of America’s most historic cities. The Nine Zero Hotel is a luxury boutique hotel where pets are treated like family. Pets stay free of charge, and there are no size or weight limitations. This downtown hotel has an in-doghouse pet package that is unbeatable. Pets are welcomed with a treat and provided with bowls and cozy pet beds. Through the concierge service, pet sitting, pet massage, pet grooming and pet walking are offered for an additional cost. The hotel is directly across the street from the Boston Common. This 50-acre public park is pet friendly and has a number of walking trails for leashed pets. For dining, the Tremont 647 has a casual vibe and serves up some adventurous American cuisine. Pets are also allowed on the patio. While pet friendly hotels in Boston are plentiful at Vacation Pet Friendly, here is one you will definitely want to visit if not stay there. Watch this! The Boston Westin Waterfront is a great pet friendly hotel located in the heart of the city. This modern and sleek hotel has lux rooms and a lively bar scene on premise. Pets are allowed up to 75 pounds free of charge, and pet amenities include the heavenly Westin pet beds, food bowls and tasty treats. 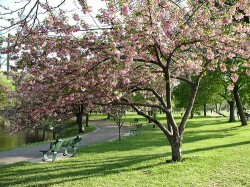 Peter’s Park is an off-leash dog park that is approximately five minutes from the hotel. This park has plenty of clean gravel, benches to rest and a separate area for smaller dogs. For some excellent French fare, the Sel de la Terra serves up a rustic cuisine of southern France and Provence. It is a pet friendly restaurant, and pets are allowed at the outside tables. Located on Freedom Trail, the Omni Parker House captures the history of the city. It also is another pet friendly hotel in Boston that is simply wonderful. This hotel accepts pets up to 25 pounds with a $50 non-refundable fee. Pet amenities include food bowls and pet beds. 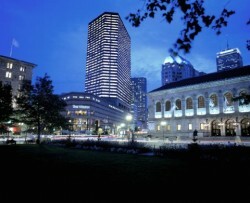 Like the Nine Zero Hotel, the Omni Parker house is across the street from the Boston Common Park. There are plenty of trails for leashed pets. Patrons of this hotel don’t have to venture off premise for excellent dining. The executive chef serves up nostalgic cuisine with a contemporary flair at its Parker’s Restaurant. The restaurant is legendary for its Boston cream pie and crab cakes with smoky chipotle sauce. Visit our Boston Travel Guide designed exclusively for pet owners. All in all, Boston is a pet friendly city with an upbeat atmosphere that both pet owners and pets will enjoy. Remember, booking early is essential when traveling with pets. See what’s available today so you get the best deals. Start your search for pet friendly hotels here. Then sit back and think of all the fun things you can do when you get there!